Who doesn’t love a great deal? I discovered Sugarbush Tavern through a local advertisement paper and through a recommendation from my mother. My husband and I often browse those publications to discover new restaurants that are local and have a coupon offer. Sugarbush had a buy-one-get-one-half-off coupon offer so we decided to step in for a family dinner and hope for the best. We love discovering new-to-us restaurants that are local to us. Giving new things a whirl is what I live for. I love the thrill of it all. Sugarbush Tavern in Eastpointe, MI – A great place to grab a burger, wings, ribs, salads, or just a great dinner! We visited the Eastpointe location but this restaurant also has a Chesterfield, MI location and that is where this place originated. They have been serving up their amazing dishes since 1994. One great thing about Sugarbush Tavern is that they take pride in using items that are local to the state of Michigan. If you love ribs you might just want to stop in and give theirs a whirl. They have award-winning ribs that were voted best in Macomb County. That is quite an honor, considering how many restaurants there are in the county of Macomb. Sugarbush Tavern Saturday Dinner Specials – They all sound fantastic! Prime Rib is the big Saturday special that I will need to chow down on someday! I don’t often see stuffed shells on menus but that was one of my all-time favorite meals when I was a little girl! I try my best to avoid gluten but one day I might just have a cheat day and order up those shells for myself. They certainly sound tempting to me. The Michigan Cherry BBQ ribs also look like an enticing offering. Since they are known for serving great ribs here I will be returning to get a half slab and a beer to wash it down. I can promise you that. I really do not like eating ribs in public because they are messy and I eat them like an animal. But YOLO and I need to try them. The Wet Burrito on this portion of the menu sure is screaming out my name. I love any and all burritos that are smothered with toppings and sauce. The Wet Burrito here comes with all the fixings and you can not beat that! And check out that Napoleon Steak! Just give me a great big piece of meat smothered in cheese. Yummo! That is one of the low carb options here. I can definitely get down with that. Sugarbush Tavern Small Courses – Ooo yummy wet burrito! And now onto the salad portion of the menu. This is where I ended up ordering from. I just had to get that great big bowl of Traverse City Chicken Salad. They all sound appetizing to me. The full-size is the perfect size for dinner or sharing as a side with your family or friends. The half-size portions of these salads would be perfect for lunchtime. There is also a decent assortment of salad dressings to choose from. There are a couple of standouts here on the sandwich portion of the menu. I love having a big fat French Dip sandwich with a bowl of au jus. I am also a big fan of ham and cheese sandwiches so I spy with my little eyes a Hammy Slammy! Oh man, did I just hear my stomach growl? I bet my husband would enjoy their Chicken Parmesan Sandwich. That sandwich even comes with spaghetti. Carbs galore right there. My mother visits the Chesterfield, MI location and raves about how delicious their cherry chicken salad is. I swear she has probably told me at least 50 times… no lie! I ended up going with the full order size because I sure was hangry. My salad came out and the presentation was quite nice. It arrived in a large bowl and it was just ready for me to tear into and devour. There was a cup of cherry vinaigrette on the side and boy was that ever a great salad dressing. It was so could I could just drink it! The bleu cheese went perfectly with this salad. For me, bleu cheese was an acquired taste. It is something that I avoided most of my life until just recently. It is kind of a hit or miss item for me, sometimes it is just too pungent. Sugarbush Tavern’s bleu cheese was to my liking. There were plenty of dried cherries in this dish to satisfy my palate. The only thing that could have made this salad better was maybe to include some fresh cherries in it as well. That would add some great texture to this salad. Traverse City Chicken Salad at Sugarbush Tavern A flavor bomb ready to go off! So good! 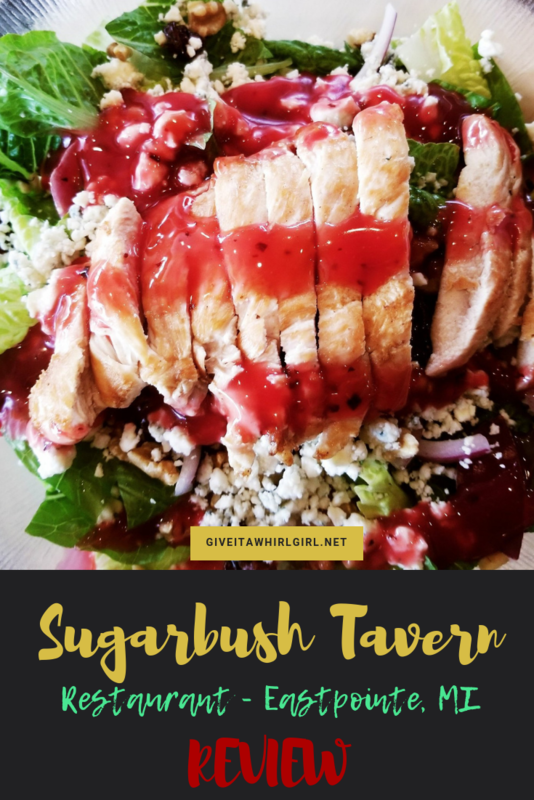 Traverse City Chicken Salad at Sugarbush Tavern – All dressed up! I can’t speak much for my husband but I will say that he did enjoy his Chicken Parmesan from Sugarbush Tavern. Chicken Parmesan is one of his favorite meals. They gave him a very plentiful amount, so much that he was stuffed and could not completely finish it off. We did not have a drink during our visit but they do have a great drink menu. My husband will have to come in one night for a date-night meal and wander around on the drink menu. Sugarbush Tavern has a weekly specials menu that can be viewed HERE. There are meal specials as well as drink specials on the menu. Saturday looks like the best day to visit. That is when they have Prime Rib on special for $17.99. Tuesday looks like another great day to visit when they offer all-you-can-eat Fish & Chips at $11.59. Fish & Chips is one of my favorite meals to order when I dine out because my family does not eat fish so I rarely have a chance to cook it at home. If I do cook fish I am the only one eating it. **Please note, that if you have a coupon you can not apply it to the weekly specials. I am very pleased with our experience at Sugarbush Tavern. The entire experience from start to finish was good enough to make me want to return again to explore other parts of their menu. My daughter came along with us too and they did have a kid’s menu. She had a couple of cheeseburger sliders and was satisfied. My husband, I know, sure did enjoy his chicken parmesan as well. I watched him pack it in and heard the mmm’s coming out of his mouth. And as for me, that Traverse City Chicken Salad was so far the greatest I have yet tried. The salad was a fantastic deal and with a coupon on top of that, we were not out too much money for an exceptional meal. I hope this post will inspire you to pay them a visit soon. I am happy that my mother recommended this place to me. If it weren’t for her I may have never gone but she always has great things to say about her trips to the Chesterfield location. I know that it is one of her favorite restaurants, and now I see why! Have you ever visited Sugarbush Tavern restaurant? What do you enjoy there? If you have not visited yet and plan on going what looks good on the menu to you? Leave me a comment and let me know. This entry was posted in Local Spots I Visited and tagged burger, cherry, chicken cherry salad, chicken parmesan, chicken salad, eastpointe, michigan, restaurant, restaurant review, Sugarbush Tavern, tavern, Traverse City cherries. Bookmark the permalink. We go to the one in Chesterfield. Great fish and chips also like the Calamari but it is usually a special. Mm mm I bet their squid is fabulous. Next time I will have to try it.